Just after completing the logo design for Dave, we applied the logo to the website and he has approved of the work! Here at BsnTech, we strive to “multi-task” by completing projects in a timely fashion. Our graphic designer was tasked with creating the logo and a web designer tasked with the website. In the end, both of them were completed at almost the same time. That shaved off at least a week or more for the completion of his full project. Dave was very happy with the results and said that the site looked fantastic. The site has a slideshow on the front which goes through a few photos that he sent us for inclusion in the website. He also chose to have social networking integration by linking to his Facebook page and a contact form so individuals could inquire about getting rates and setting reservations. We appreciate the business from Dave and hope he will have us do any other changes he needs! 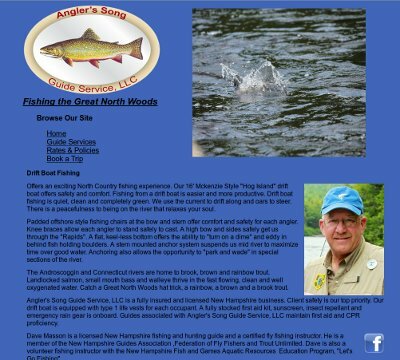 Dave’s site is at anglerssongguide.com.